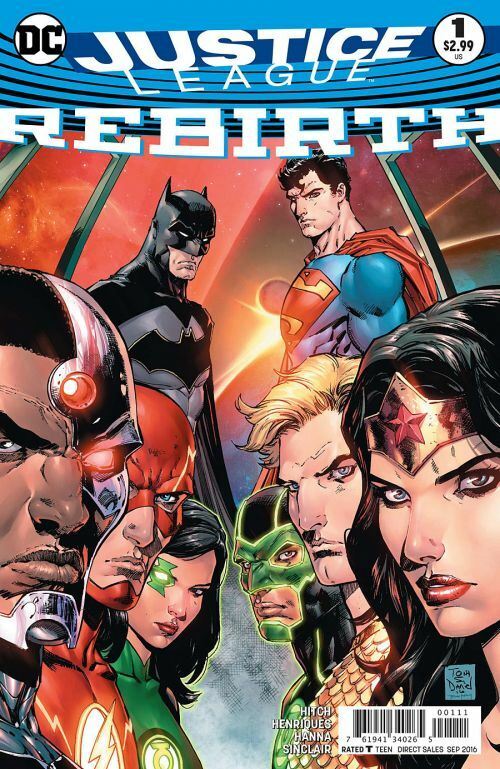 Justice League Rebirth is somewhat of a “0” issue. More of a prelude and a re-introduction to the team than anything else. Bryan Hitch, Daniel Henriques and Scott Hanna pit the remnants of the previous team with some new blood, and have them take on a giant alien bug. It’s not the most exciting foe, but is pleasantly reminiscent of Starro the Conqueror, the giant alien starfish that the original Justice League fought in their first adventure. In fact, the story even makes reference to Starro, as well as Darkseid, and firmly draws on the League’s history. 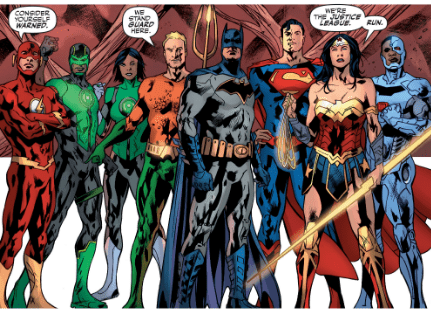 The line-up is much like that of the original team, with Superman, Batman, Wonder Woman, the Flash and Aquaman. There are two Green Lanterns instead of one, and Cyborg replacing the Martian Manhunter, a holdover from the New 52 line-up. I really like having Cyborg as a member of the Justice League, his power set adds something that none of the others can duplicate, but I do miss the Martian Manhunter. Everyone gets a chance to show what they can do, although the pre-eminent characters in the tale are the two Green Lanterns, Jessica Cruz and Simon Baz, as well as Superman. Hitch touches on a number of events from the Rebirth storylines in the various character’s books, although it’s really only with Superman that this ties in closely. For those who haven’t been following the Rebirth titles, the Superman who has his first adventure with the Justice League in this story is the pre-52 universe Superman, married to Lois and raising their young son Jon. The other Leaguers are used to working with a Superman, but not this Superman. Batman shows his characteristic relaxed and friendly side when he comments to the other Leaguers that they need this Superman to work with them, if only so that they can keep a close watch on him, until Batman determines whether he can truly trust him. The art is very good, all the heroes come off well, and the giant alien bug is suitably unpleasant. But something left me a little blah by the end of it. Perhaps it was simply that it spent its time making sure all the bases were touched, and setting up a forthcoming storyline, rather than being intrinsically exciting. That’s why I view it more like a “0” issue than a first issue.